It would be a stark indicator of my age to confess I always think of Caryl Simon--one of my all time favorites---and her song, "Anticipation" when pondering this subject. As I sit and write, I am humming the tune. Almost everything I read about the act of anticipating revolved around happy events, but I have had anticipation in my life concerning the hard times as well. It is that tightening of the gut---knowing something is about to happen- sometimes good but sometimes heart breaking or difficult. Perhaps dread would be the antonym for anticipation if it is only referred to with the happy moments in life. One of my favorite images for the day to day anticipation in life is above. It pretty much says it all. The bear---well-they are anticipating a great meal------BUT---the fish is thinking BUT I'm carrying the future in me---SURELY I won't end up as bear food?? 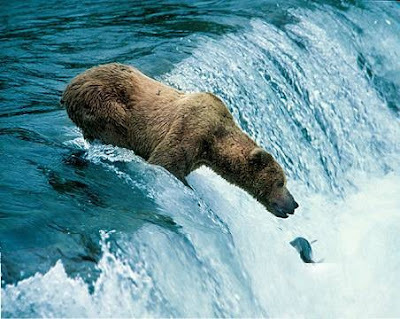 Perhaps the fish is in dread--for after all who would anticipate being the bear's next meal? Today the little grands' anticipation has reached a fever pitch. 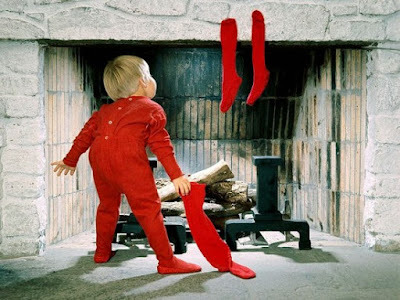 There is much discussion about climbing down chimneys, sacks full of toys, reindeer that can fly and what will I get? The excitement over the long awaited night is palatable when you walk through the door. Their anticipation is fueled by those stories swirling around them and it seems bedtime will never get here. I remember those wonderful times in my life when I literally shivered with the anticipation of blessed events. Event upon event in the lives of my children and now my grands. I have anticipated the beauty of the mountain top while in the struggle of the climb. I daily anticipate the grandeur of the sunset and the glory of the sunrise in the midst of the dark of night. I even remember the feeling of anticipation knowing I was about to be kissed---AH---sweet memories! Today though---we pause and remember---the anticipation of a fallen world --long ago. And we prepare our hearts, in awe and wonder--with shivers of excitement as we celebrate the birth of The King of Kings----on this Silent Night---this Holiest of Nights--in a little time called Bethlehem. 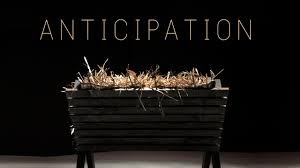 Wishing you Sweet Anticipation today as we prepare to celebrate His Birth, Dear Friends! The very thought of your grandkids and their anticipation just brings such joy to my heart, Lulu...such joy!!! Merry Christmas to you sweet friend. Yes---Christmas through the eyes of little ones is such a blessing! Merry Christmas to you & your men, Sweet Friend! You know Lulu, you write so well that sometimes I have to be very careful as to what I comment here. Yes, I'd like to tell a joke or two, but I do not want to detract from the seriousness of what you write. One daily anticipation I have is to visit this Blog and wonder what else you will write. You never fail to surprise. Keep up the good work. I have known you online for about a year now and have enjoyed your Blogs immensely. Thank you. On reflection ... I did have a relative we called Auntie Cipation. I remember as a kid she used to kiss us with slobbery lips leaving our cheeks wet. We used to race away to be the last one to be kissed. We certainly did not anticipate her kisses as children. But we were fascinated by her somewhat. Have you ever been fascinated, Lulu? I was fascinated with a needle on my arm as a child. Anyway, Auntie also had false teeth. One day when she visited us she left them by her bedside and the dog took them and chewed them up. What a fun Christmas that was. Hearing her sing winkle bells winkle bells winkle all the way. OK ... she may not have been called Cipation ... but it's all I could think of on the spur of the moment. May I wish you this day a wonderful splendid and the best Christmas ever, Lulu; and may you always be happy. You are kind, Victor! I must confess I often wonder has the well run dry AND THEN GOD! "I was fascinated with a needle on my arm as a child." OH GOODNESS--where do you come up with these!!! Christmas Blessings to you and yours, Victor!